I suffer from frequent and severe migraines. With insurance costs rising, and medication expenses becoming absolutely astronomical, I’m always happy to find a natural/holistic solution to any of my medical problems. Tomoson.com and La Lune Peppermint Essential Oil allowed me to try an all-natural, essential oil in exchange for an honest review. This gave me an ideal opportunity to explore a wonderful solution to my various asthma, allergy, and migraine issues through the use of one wonderful product. 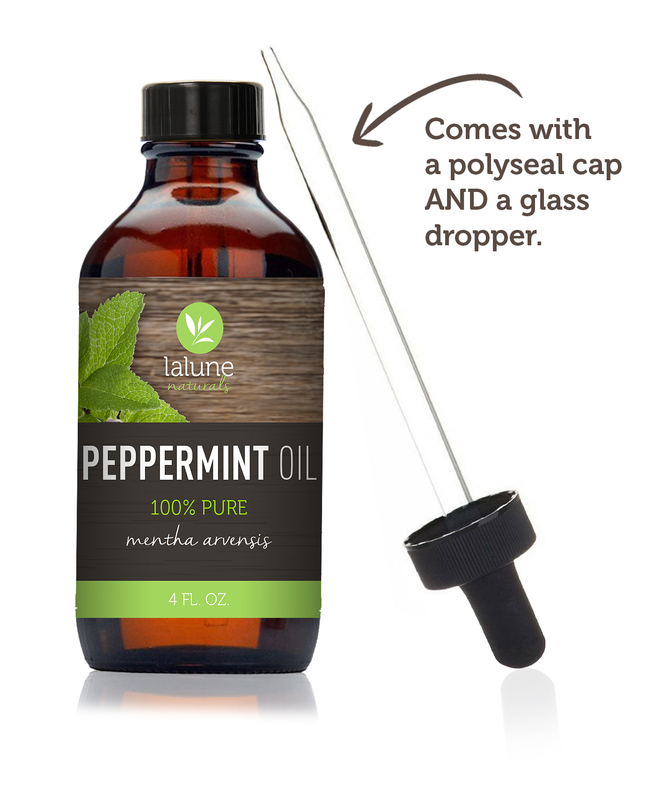 With the purchase of this product, La Lune provides an excellent ebook filled with spa treatments and home remedies using this peppermint essential oil. 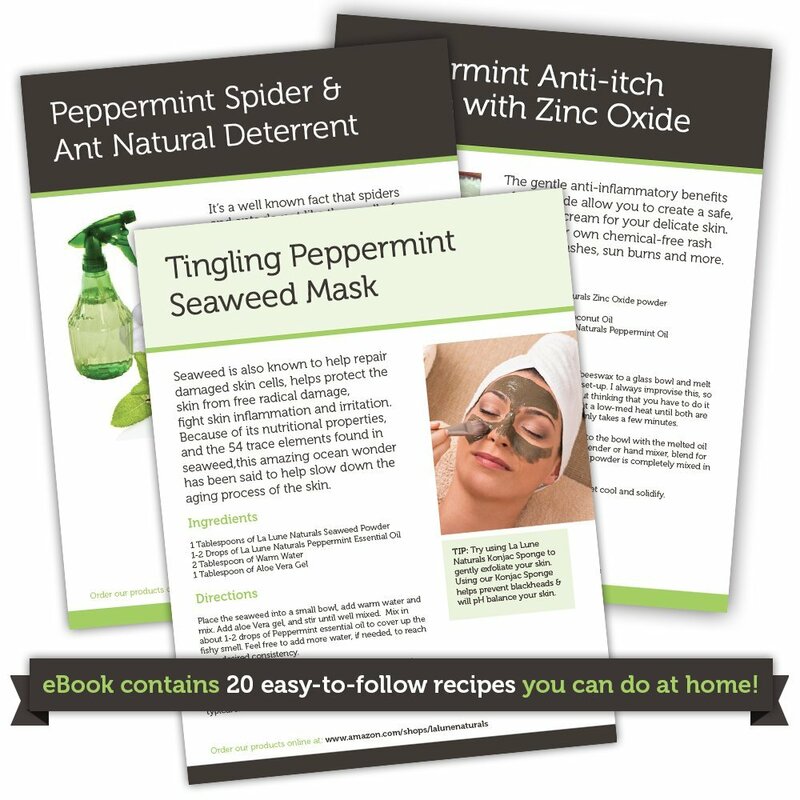 Using this ebook, I was able to find wonderful treatments for stress, migraines, acne, athlete’s foot (my son has some serious issues), itching, insects, cellulite, air freshener (it’s easy to make a wonderful and refreshing scent for home use) and many more. All this from one simple and affordable item: La Lune Peppermint Essential Oil. This item is 100% natural. Shortly after being approved for this product, a necessary hospital treatment was delayed due to insurance issues. As a result, my health began to plummet uncontrollably. When I began to experience a migraine, I immediately searched through the included booklet for the recipe for migraine remedies. Not only did the migraine remedy immediately begin to help, I also used the book to find sinus/allergy solutions and my breathing began to improve. I continued to use this product for a plethora of other issues. For instance, when placed in a steamer, peppermint oil helps reduce mucus in the throat. Simply add a few drops of peppermint oil to boiling water and breathe in the steam. For best results, remember to always carefully dilute as described within the recipe booklet, either with a carrier oil such as grapeseed oil, jojoba oil, or almond oil. There are no additives, and no fillers in this product. It is certified by the National Association for Holistic Aromatherapy (NAHA). La Lune has kindly offered to give away a bottle of its wonderful Peppermint Essential Oil. Those interested in entering this giveaway should follow my blog and comment below by 5 p.m. Wednesday, February 25, letting me know the best way to contact you. If you have any trouble entering via this blog, you may also enter via my Tumblr blog at http://michelle-willms.tumblr.com, or by sending me a Tweet at @willms_m saying “enter me into your giveaway for #LaLunePeppermint. You can also send me an email asking to be entered at michelle_willms at yahoo dot com. I rate this product 5 brilliant, healthy stars!! My family is very health conscious. With today’s youth being engrossed more and more in TV and indoor activities, and work keeping adults from exercise, it’s always great to find fun, fast, easy ways to get a great physical and cardio workout in just a few quick minutes. I received a wonderful, high quality jump rope from Naturalico to try in exchange for an honest review. This lovely wire jump rope is exceptionally well-balanced, using high-grade ball bearings. This allows the rope to turn faster. The handles turn, as well, so that tangling is prevented. It has a 10 ft. cable, so it easily accommodates people of any height. Additionally, it’s adjustable. This allows the jumper to ensure the rope is at the precise length for precision jumping. It also comes with a lovely travel bag, so the jump rope is easy to pack up and carry around. It fits in computer cases, backpacks, purses, glove compartments of cars, and other small spaces. I adjusted the rope for each of my children in less than ONE MINUTE for each child. Understand, this rope is NOT a toy. This is for serious training. It’s appropriate for cardio and fitness training for all sports, or just to stay in shape. According to information provided by the company, ten minutes of jumping rope “can provide the same calorie burn as 30 minutes of slow cardio” workout. I was immensely impressed with the quality of this jump rope, and with the quality of service provided by the company. I rate this product 5 healthy stars. All opinions expressed in this review are my own. I would not recommend a product I would nor or do not use in my own home. I’ve used many retinol serums and products, but when I saw the opportunity to try Azure Naturals retinol in exchange for an honest review, I was really excited. Azure Naturals uses a combination of products that is safe, and is guaranteed. Additionally, it is made in the USA with the highest quality natural and organic ingredients available: 97% Natural, 72% Organic. Additionally, it contains no alcohol, no parabens; it’s plant based, has no GMOs, it’s cruelty free and is never tested on animals! There’s a wonderful giveaway and discount offer connected to this post, so please keep reading!! The earlier you start using a retinol moisturizer, the better, but it’s never, never too late. Start out using it every other day and increase gradually until you can use every day. Azure Naturals is a wonderful product that is almost entirely natural and/or organic. It is a thick, clear serum that has a rich, earthy odor that dissipates almost immediately after the product has been massaged into the skin. It dissolves very rapidly. Remember, a small bit goes a very long way, so use sparingly. Remember to use a good moisturizer after applying the retinol serum. I loved this serum. I have sensitive skin and serum worked well; I had no breakouts while using this product. It’s professional strength, so you can know you’re getting the best possible strength for the money. Azure Naturals has a nice line of products for all your skin care needs. I rate Azure retinol serum 5 healthy stars. This review is my own opinion; I would never recommend a product I do not or would not use in my own household. The company has been kind enough to provide a bottle of this product to one of my followers. 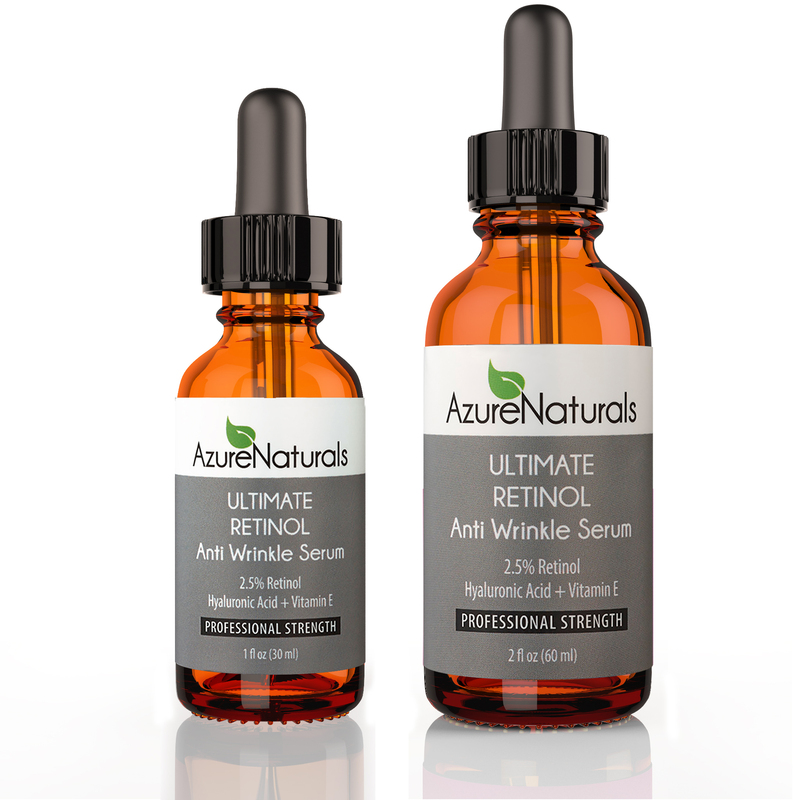 If you’d like to enter the giveaway for Azure Naturals Retinol Serum, please let me know by either commenting via Twitter at @willms_m, on either of my blogs at http://michelle-willms.tumblr.com, or https://michellewillmsblog.wordpress.com, or even via email at michelle_willms@yahoo.com (please put AZURE NATURALS GIVEAWAY in the subject line) by Friday, Feb. 20. For those of you who don’t win the giveaway, Azures Naturals has generously offered a 20% giveaway. Just entered the code AZURES20 when checking out on Amazon.com. the product can be found at: http://www.amazon.com/GUARANTEED-STRONGEST-Hyaluronic-Penetrates-OZ/dp/B00KXG8JF4/ref=sr_1_1?ie=UTF8&qid=1424140067&sr=8-1&keywords=Azure+naturals+retinol.